Your Clients Overview page is essentially your address book, listing all the clients/customers you have in Studio Ninja. Add new client: Click the '+ Add' button to bring up the Add new client lightbox. Here you can add all your new clients details. Filter: You can filter your clients by Active Clients and Inactive Clients. Active Clients are clients that are linked to jobs that are currently in progress. Inactive Clients are clients that are not linked to a job or are linked to a job but the job has been completed. Edit: Click the 'Edit' button to bring up the your client details. Here you can edit and update all your client details. 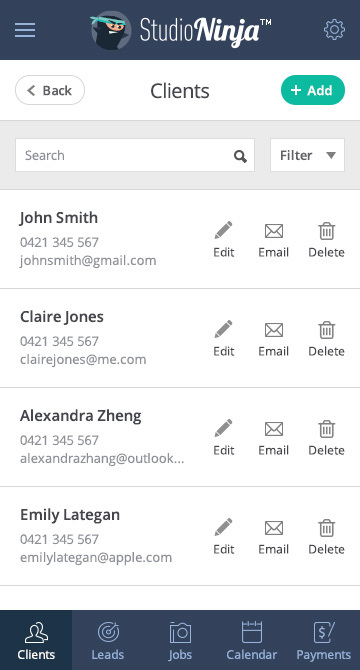 Email: Click the 'Email' button to send emails to your clients. Delete client: To delete a client simply click on the trash can icon. From the Clients Overview page, click on + Add button to bring up the Add new client box. The client first name and email address are both mandatory fields. Client: displays additional client information. You can also Edit your client details, Subscribe/Unsubscribe the client, or Delete the client. Jobs section: displays all the jobs currently in progress and completed for this client. Mail box: displays all the outgoing emails sent to this client, as well as send them an email. Invoices box: displays all the invoices relating to this client. Client Notes: displays any notes that you have made about this client and the ability to edit your notes. 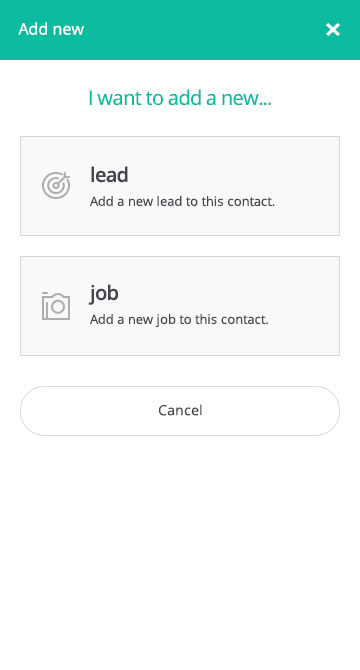 Add a new Job or Lead: Click on the + Add button to add a new Lead or Job for this client.